Food on a stick! Need I say more? Why is it that food on a stick is extra scrumptious. And grill marks too. Grill marks make everything look more scrumptious. And then peanut butter sauce!! The most scrumptious of all. 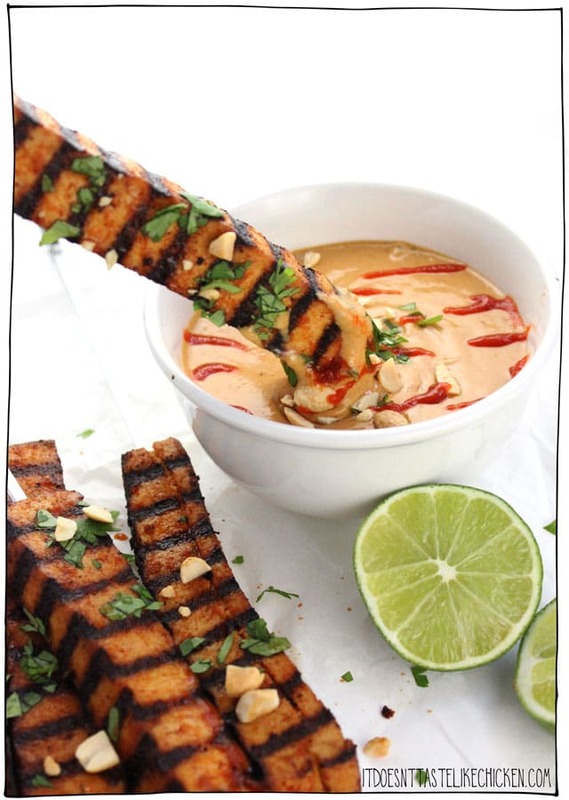 So naturally, you can assume that these Grilled Tofu Skewers with Spicy Peanut Sauce are scrumptious times 3. 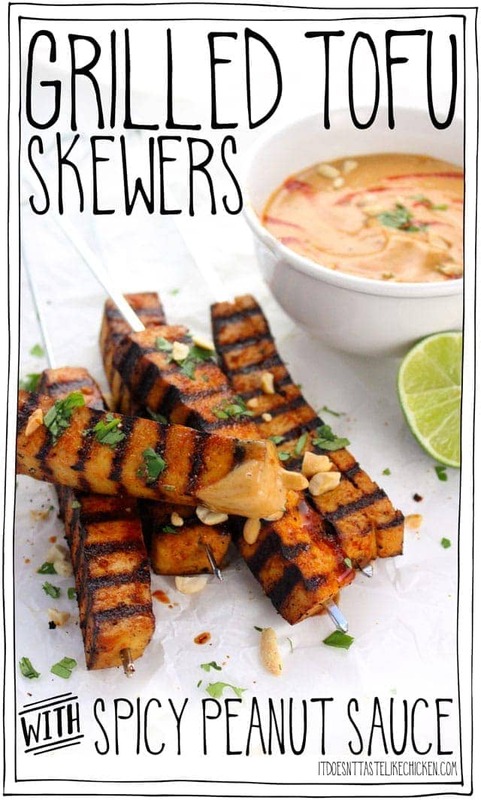 Not only are these grilled tofu skewers out of the world delicious, but they can also be mostly prepared ahead of time. The tofu can marinate in the fridge for up to 3 days, and the spicy peanut sauce can be made ahead and stored in the fridge as well. 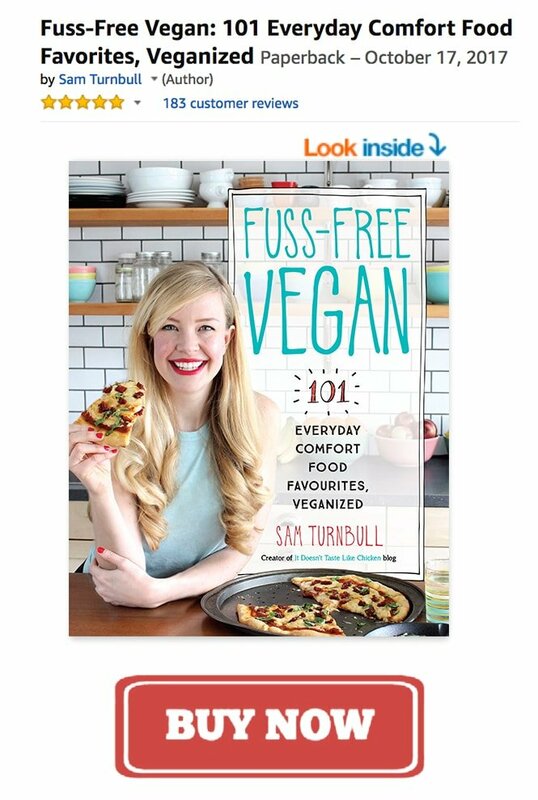 So all you have to do is grill the tofu up when you’re ready to serve. Easy peasy. 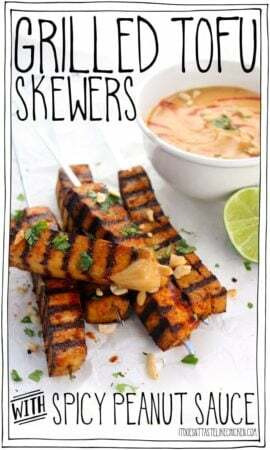 I love serving these grilled tofu skewers along with a baked potato and a salad or some grilled veggies, but if you are looking for a party appetizer, you can cut the tofu in half, and serve them on mini skewers. So cute. 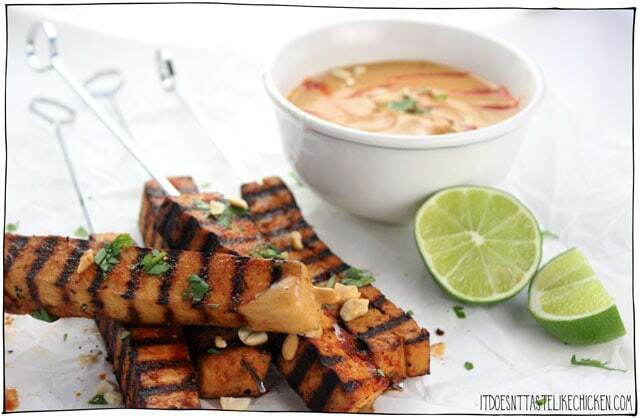 To make Grilled Tofu Skewers with Spicy Peanut Sauce: first drain and press the tofu. Once the tofu is pressed, cut the block into 8 long sticks. Or for an appetizer, you can cut the sticks in half to make 16 small sticks. Add the soy sauce, water, agave, smoked paprika, and garlic powder to a sealable bag or dish and mix. 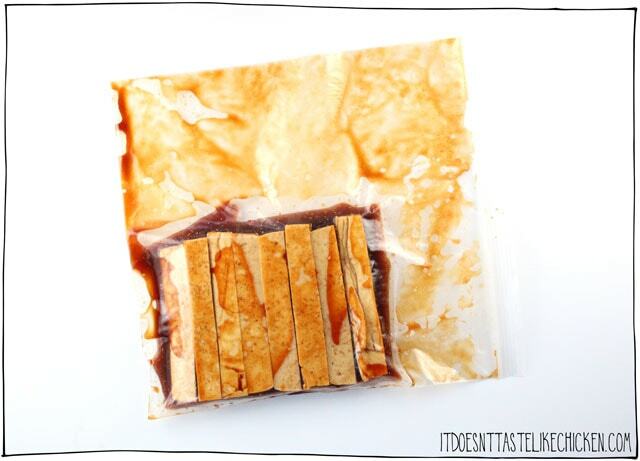 Add the tofu to the mixture and let marinate covered in the fridge for a minimum of 30 minutes or up to 3 days. 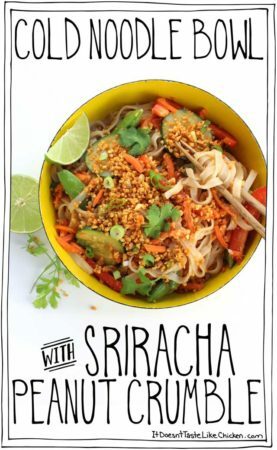 To make the spicy peanut sauce mix together all the ingredients in a small bowl. 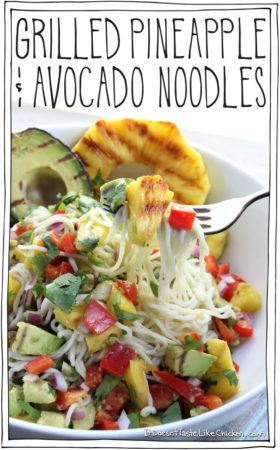 This can be made ahead of time and stored in the fridge. If using wooden skewers, soak them in water for 30 minutes before using so they don’t burn. Thread the tofu onto the skewers lengthwise. Note: I didn’t do this because I only had these really long awkward metal skewers that don’t fit into my grill pan, so I ended up skewering them after they grilled, which was tricky and burnt my fingers, so don’t do what I did!! Heat your BBQ or grill pan over medium-high heat. 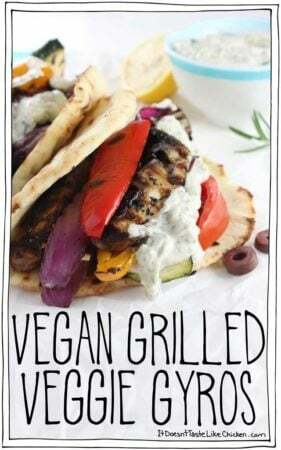 When hot, grill the skewers for 10 – 15 minutes, turning as needed until grill marks form on each side, brushing with the leftover marinade as they cook. Remove from the heat and serve hot with the spicy peanut sauce on the side for dipping. Decorate with any garnishes you like. 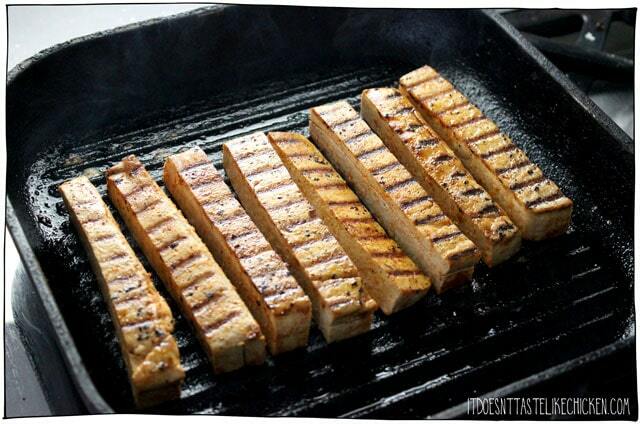 The tofu can marinate in the fridge for up to 3 days, then just grill on your BBQ when ready to enjoy. These also work great as a party appetizer. For the tofu: once the tofu is pressed, cut the block into 8 long sticks. Or for an appetizer, you can cut the sticks in half to make 16 small sticks. Add the soy sauce, water, agave, smoked paprika, and garlic powder to a sealable bag or dish and mix. Add the tofu to the mixture and let marinate covered in the fridge for a minimum of 30 minutes or up to 3 days. 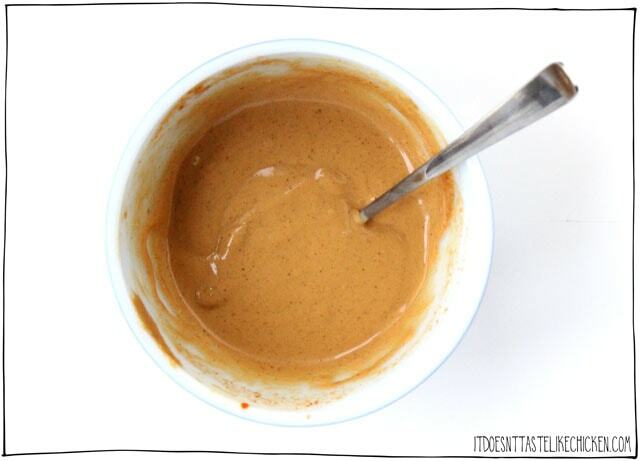 For the spicy peanut sauce: mix together all the ingredients in a small bowl. This can be made ahead of time and stored in the fridge. To grill the tofu: If using wooden skewers, soak them in water for 30 minutes before using so they don't burn. Thread the tofu onto the skewers lengthwise. Heat your BBQ or grill pan over medium-high heat. When hot, grill the skewers for 10 - 15 minutes, turning as needed until grill marks form on each side, brushing with the leftover marinade as they cook. Remove from the heat and serve hot with the spicy peanut sauce on the side for dipping. Decorate with any garnishes you like. *If you are new to pressing tofu, check out The Ultimate Guide to Pressing Tofu. 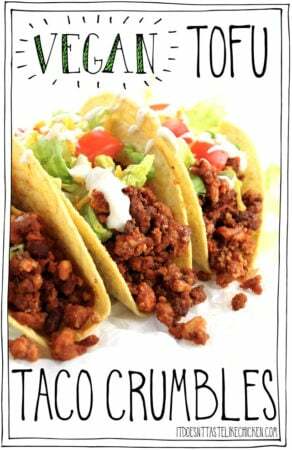 These are soooooo tasty and, of course, super easy. I grilled on the grill pan and they were perfect. Both the 18 month old and the picky almost-5 year old loved the tofu. Thanks for another great recipe, Sam. Yay! Thrilled you enjoyed another recipe, Karen! 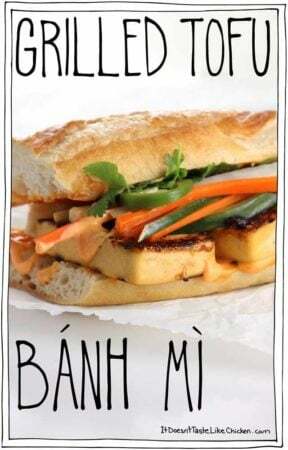 We don’t have Trader Joe’s in Canada ~cry~ that tofu sounds awesome. Made these this week. So EASY! I don’t have a grill pan so I cut them in cubes and put it in my air fryer! Totally awesome. My husband was holding his breath because my tofu usually doesn’t turn out very well. OMG! Best tofu I have ever made! 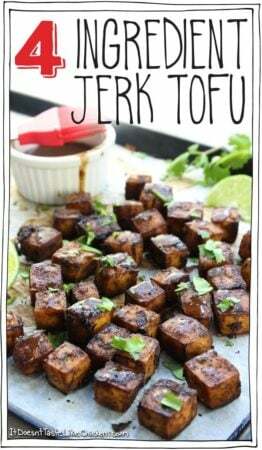 The marinade is great and the pressed tofu soaked it up and was not too soft or wet for the fryer. Peanut sauce was easy and delicious. Yay! Tasty! I made these per the recipe, but veered off slightly on the prep. I don’t own a grill pan, so I grilled them on my George Foreman grill, sans skewers. Also, I cooked jasmine rice and stir fried some veggies, so I made the peanut sauce with a bit of extra coconut milk, and heated it until bubbly, then poured it over the whole plate. Only thing I will change is some extra hot sauce in the peanut sauce. It got lost with the rice. Can you tell me what soy sauce pepper is? And I have severe food allergies. There are not any hot sauces I can use because of corn. Could you recommend some dried powdered peppers that would work as a substitute? I know vinegar is a main ingredient of hot sauce but I can’t have white vinegar. I could substitute in apple cider. My mind goes to Ancho chilies but I don’t know the original taste of your amazing looking skewers. Thank you for another great recipe!! Oops, that was a silly typo from when I was writing the recipe! hahaha. All fixed! Cayenne is always great for a little kick, I would add a little at a time to taste as it can be very spicy. Enjoy! Grill marks really do make everything look better. Can’t wait to try these out! 🙂 Everything looks beautiful, Sam!